Melania Trump calls Kavanaugh "highly qualified"
Melania Trump said the "I REALLY DON'T CARE, DO U?" jacket she wore in June on a plane to a Texas detention center housing immigrant children separated from their parents was a message for the media. The first lady made the comment during an interview with Tom Llamas on "20/20" that aired Friday night. Melania Trump said it "obvious" the jacket's message was not for the children she visited. She visited a detention center along the U.S.-Mexico border during heightened tensions of Mr. Trump's policy of separating migrant families. "I wore the jacket to go on the plane and off the plane," the first lady said. "After the visit, I put it back on because I see how [the] media got obsessed about it." She said she the jacket "for the people and for the left-wing media who are criticizing me. I want to show them that I don't care. You could criticize whatever you want to say, but it will not stop me to do what I feel is right." She appeared to backtrack in her next comment, calling the jacket "kind of a message, yes. I would prefer that they would focus on what I do and on my initiatives than what I wear." Melania Trump's comments Friday echoed what President Trump tweeted about the jacket. 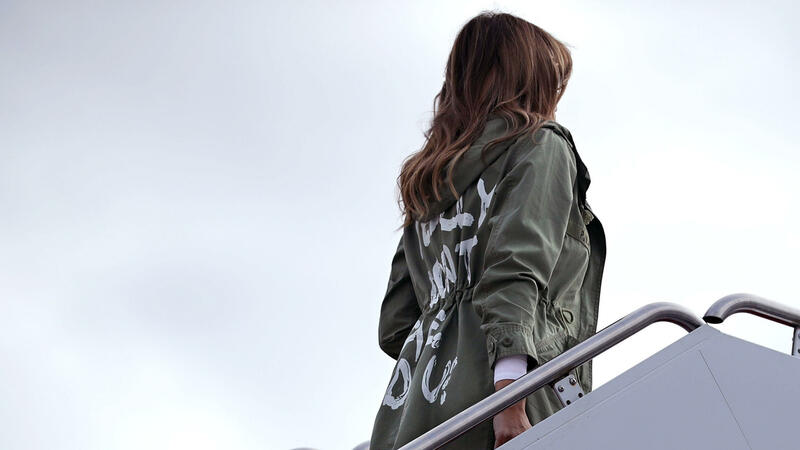 After she returned home, Mr. Trump said the jacket's message "refers to the Fake News Media. Melania has learned how dishonest they are, and she truly no longer cares!" But the comments were not what her spokeswoman, Stephanie Grisham, said at the time, which was that it was "a jacket. There was no hidden message. After today's important visit to Texas, I hope the media isn't going to choose to focus on her wardrobe." In portions of the interview that were released earlier, Melania Trump called herself the "most bullied person" in the world. Melania Trump said women who accuse men of sexual misconduct "need to show evidence." She also said her husband's alleged infidelities are "not concern and focus of mine." The first lady criticized the media's speculation on their marriage. She said "we are fine" when asked if she loves her husband. Llamas interviewed Melania Trump during her trip to Africa, her first solo trip abroad since Mr. Trump took office in Jan. 2017.